I love going to the DI. (For those who don't know what that is, it's like a goodwill or thrift store.) I go there probably once a week. Some might say that's obsessive, but I love it. What I don't love, is the smell...i swear all thrift stores have a smell....and I am not very fond of it. Anyways, I found a really great frame a couple months back and finally found a use for it. I don't have a before picture of the frame, but it wasn't anything great to look at. It was just a wood frame, but it had some character to it. So to fix it up, I painted the same color as Hannah's dresser and then used some pink paint to distress it a little and then sanded it. Here is the frame after I finished it. I really love how it turned out and it will go perfect in Hannah's room. Now, onto what I actually put inside the frame. I love buttons, actually I am obsessed with buttons. I am positive that I have more buttons than is probably necessary. Sometime I will have to take a picture of my button collection, but today I am going to show you my button tree. I have made something very similar to this for fall decorations and such, but I have never made an everyday button tree. I love how it turned out. It is so simple, but it works. Step 1: Paint your base piece. I painted it plain pink and then later decided to add some light pink scrolls, and swirls to add something more. Step 2: Cut out the tree and hills. 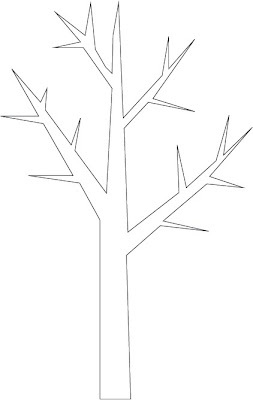 For the tree I made this template. I just free-handed the hills. Step 3: Cut out foam board for your background. Step 4: Mod podge your tree and hills onto your foam board. Step 5: Hot glue buttons onto your foam board. I like to lay mine out before hand to make sure I have them right where I want them and then I glue them on. Lindsey I am in love!!!! I became a new follower. Awesome tree.....I hope you don´t mind if a feature on my blog. Thanks for sharing your tutorial! Can't wait to make one for my home! found your blog a few days ago and I am loving your ideas! They are so creative and cute!! I can't wait to try some out. Thanks and keep the inspiration coming! this is SO pretty!!!! thanks so much for sharing it - i can't wait to do one! This is such a cute craft! I think it would be pretty in my daughters room. Thanks for inspiring me today! I love it! This is just too cute. I may have to try it for my niece. She is expecting her first child in December and this would be adorable in the nursery. Thanks for sharing! I love this, so cute and happy! Thanks for sharing! I just found my new favorite blog!! I spent an hour looking through it last night! I am in LOVE!! Keep these crafts coming!! This is adorable! Can't wait to check out your other projects! I love how this turned out. It would match my kids room perfect. I'll be featuring this on Sunday-hope you don't mind. Oh my gracious! That is sooo precious! Great job! That would look adorable on a t-shirt too! Hmmmm. I'm bookmarking this! That is so adorable! Now I'm dying to take out some buttons and use them. I love this!...great idea!...im obsessed with trees! VERy cute! Simple design, well executed! The buttons are my favorite detail. It is a beautiful project! I am a new follower from a blog hop! Would love for you to check out my blog and follow back! This is darling! Love the pink/green color combo too! That is so cute! Thanks so much for the how-to, I'll be linking. I love it!! Making one for my dd's room! So fun! I especially love the "grow". It'll be darling w/ the birds. I made this the other day and posted it on my blog if you want to see it! Totally cute!!! I included this in my "Non-sewing Handmade Gift Ideas" blog: http://www.amytriedit.com/2010/11/non-sewing-handmade-gift-ideas.html and will be making it for my daughter's room for Christmas.